LE MOYNE DE SAINTE-HÉLÈNE, JACQUES, soldier; baptized 16 April 1659 at Montreal, son of Charles Le Moyne and Catherine Thierry; d. at the beginning of December 1690 at Quebec and was buried there on 4 Dec. 1690. 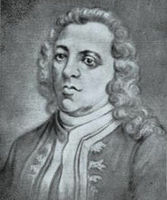 In 1684 Sainte-Hélène, one of the famous Le Moyne brothers, fought a duel with François-Marie Perrot, the governor of Montreal who had been dismissed from his office. In that year Jacques Le Moyne accompanied his father on the expedition which Governor Le Febvre de La Barre commanded and which had unfortunate consequences. It was however from 1686 on that he won fame. He associated himself as first lieutenant with the Chevalier de Troyes, who had been given the task of driving the English out of Hudson Bay. In addition to contributing to the glory of giving back to France territories that she claimed as hers, Sainte-Hélène, with his brothers Pierre Le Moyne* d’Iberville and Paul Le Moyne* de Maricourt, represented in this expedition the interests of the Compagnie du Nord, with which his father, Charles Le Moyne, was closely associated. After an 85-day trip via the Ottawa River, Lake Timiskaming, and the Abitibi and Moosonee Rivers, the little force arrived in sight of Fort Monsipi (Moose or Saint-Louis) on James Bay. The Chevalier de Troyes entrusted Sainte-Hélène and 18 men with the task of attacking the left flank of the fort, which seemed to be strongly built. Once over the stockades, Sainte-Hélène forced his way into the place, sword in hand. Resistance crumbled. Negotiations had begun, when one of the English thought better of it and decided to aim a cannon at the invaders. Immediately a bullet struck him right in the forehead. 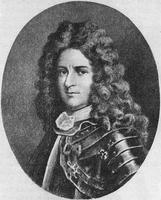 As Sainte-Hélène had the reputation of being a good marksman, the shot was attributed to him. After Monsipi the next objective was Charles Fort (Rupert House) and an English ship that was calling there. Having been sent to make a reconnaissance, Sainte-Hélène reported that neither the fort nor the ship was capable of putting up a good defence. While Iberville was to seize the ship, Sainte-Hélène was given the task of taking the fort by storm, which he succeeded in doing with very great ease. Their efforts were then directed against the third fort, Quichicouanne (Albany). Sainte-Hélène was again chosen to reconnoitre the area. Quichicouanne was better guarded than the other posts. The Chevalier de Troyes decided to lay siege to it. Sainte-Hélène and Iberville acted as gunners. The English capitulated. The French renamed the fort Sainte-Anne. The Chevalier de Troyes’s expedition was a complete success, but the credit for it was due above all to Iberville and Sainte-Hélène. Jacques Le Moyne’s short career knew little respite. 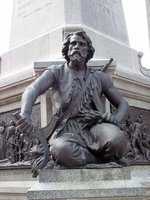 In the summer of 1687 we find him at the head of 300 Indians in the vanguard of the expeditionary corps led by Governor Brisay* de Denonville against the Senecas. In the same year Iberville requested the command of a company for him. Denonville made him lieutenant to M. de Merville. In the summer of 1689 the Compagnie du Nord wanted to supply Iberville on Hudson Bay with fresh provisions and to request him to return to Quebec with a load of pelts. At the same time it wanted to try out a new route which was supposed to take one to the Bay in 28 days. The company entrusted the task to Sainte-Hélène, who was accompanied by a detachment of 38 men, including several sailors, and who was commissioned to sail to Quebec the English ships that had been seized in Hudson Bay. Leaving on 5 July, Sainte-Hélène met his brother on 15 August at Fort Sainte-Anne (Quichicouanne). 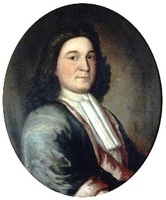 After discharging his mission, he returned to Quebec in November 1689, just in time to take part in the winter campaign of 1690 against the English establishments in New England. 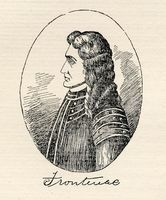 In 1690 Governor Buade de Frontenac decided to reply to the attacks directed against New France by the Iroquois and encouraged by the English. He raised three expeditionary corps, one of which was recruited at Montreal, another at Trois-Rivières, and the third at Quebec, and which had the task of paying the English back in their own coin, as well as of restoring French prestige among their Indian allies. The Montreal detachment was composed of 210 men, 114 of whom were French. It was under the command of Le Moyne de Sainte-Hélène and Nicolas d’Ailleboust* de Manthet. Leaving Montreal at the beginning of February, the little corps hesitated between two possible objectives, Albany (N.Y.) and Corlaer (Schenectady), and then decided upon the second place, as it presented fewer risks and was better suited to the sort of surprise attack that was being contemplated. On 18 February, at nightfall, they were in sight of the post, which was inhabited mainly by Dutch people. As at Lachine the preceding year, the inhabitants were asleep, with no suspicion of what was in store for them. Sainte-Hélène and Manthet stationed their men around the village and at the strategic points. Then the signal for the attack was given. The inhabitants of Corlaer suffered hours of terrible anguish until dawn. Some 60 persons were massacred. Others succeeded in fleeing in the direction of Albany under pitiful conditions. The assailants took 25 prisoners and spared about 50 people, most of whom had put up no resistance. The houses, about 80 of them, were left to the Indian allies, who set fire to all but five or six. The next day Sainte-Hélène set off again for Montreal with his men, leaving behind him a scene of utter desolation. These raids as authorized by Frontenac in 1690 have been severely censured by a number of historians, particularly those of American origin, because of the savagery and cruelty which they occasioned. The blame also falls upon the commanders of these expeditions, in particular upon Sainte-Hélène. French-Canadian historians have not failed to point out that in the 17th century the rules of war, particularly on the American continent, were not as rigid as they can be today, and that, moreover, we are concerned with punitive expeditions that were intended to check the barbarous attacks by the Iroquois against New France. By inflicting upon a few New England posts the fate that had been reserved for the post at Lachine, it was hoped that the English would be made to think twice before hurling the Iroquois against the French establishments. In any event, the expedition against Corlaer throws light upon the personalities of Sainte-Hélène and his companions. By this time they were already displaying the characteristics that distinguished the Canadian soldier of the 17th and 18th centuries as opposed to the French regular soldier. Like his brothers, Sainte-Hélène had learned the art of fighting in the immense savagery of the North American continent. He derived from the Indian his technique, his courage, and also his cruelty. In October 1690 we find Sainte-Hélène back at Quebec. He had come to aid his people who were defending the capital of New France against Phips’s attacks. He was posted to the artillery. On 18 October some of Phips’s ships, including the flagship, neared Quebec to bombard it. The retort was fierce. Sainte-Hélène’s firing was accurate. The next day two of the ships had to retreat and two others tried vainly to take shelter in the Anse des Mères. The flagship was leaking and its mainmast was nearly shot away. Many of its crew were dead or wounded. 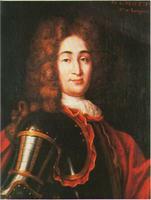 On 7 Jan. 1684 Jacques Le Moyne de Sainte-Hélène had married Jeanne Dufrenois in Montreal. As she was only 11, a dispensation was necessary, which Bishop Laval* gladly granted because of “the fidelity . . . with which he has always refused to misuse the liquor trade with the Indians, but rather to be guided by the fear of God in his dealings with it.” Sainte-Hélène had three children, one of whom, Jacques, carved out a career for himself in Louisiana. “Acte de sépulture de Lemoyne de Ste-Hélène,” BRH, XXXV (1929), 707. Charlevoix, Histoire, I. Coll. de manuscrits relatifs à la Nouv.-France, I, 482–531, 551–59. JR (Thwaites), LXIV, 60, 275. La Pot(h)erie, Histoire, I. Chevalier de Troyes, Journal (Caron). Frégault, Iberville. HBRS, XXI (Rich). A. Jodoin et J.-L. Vincent, Histoire de Longueuil et de la famille de Longueil (Montréal, 1889), 138–43 et passim. Robert Le Blant, Histoire de la Nouvelle-France: les sources narratives du début du XVIIIe siècle et le Recueil de Gédéon de Catalogne (1 v. paru, Dax, s.d. ), 169–272. É.-Z. Massicotte, “Le Moyne de Sainte-Marie et Le Moyne de Martigny,” BRH, XXIII (1917), 125–27. P.-G. Roy, “Le duel sous le régime français,” BRH, XIII (1907), 131f. 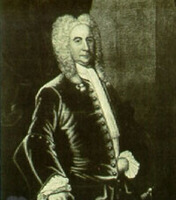 1690, Sir William Phips devant Québec: histoire d’un siège, éd. Ernest Myrand (Québec, 1893). Bibliothèque et Arch. Nationales du Québec, Centre d’arch. de Montréal, CE601-S51, 16 avril 1659, 7 janv. 1684; Centre d’arch. de Québec, CE301-S1, 4 déc. 1690. 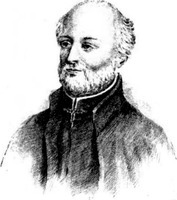 Jean Blain, “LE MOYNE DE SAINTE-HÉLÈNE, JACQUES,” in Dictionary of Canadian Biography, vol. 1, University of Toronto/Université Laval, 2003–, accessed April 24, 2019, http://www.biographi.ca/en/bio/le_moyne_de_sainte_helene_jacques_1E.html.